Charming three apartments with common patio, two apt 35 m2, one 45 m2/ 400 & 500, sq Ft/. All apartments have separate entrance . Perfect for short & long stays. It's locate 10 min walk from parque central & 5 min-two block- from calle Calzada. We offer all amenities with international standard. The apartment is new & modern construction with personal touches. All apt have equipped kitchen ,bedrooms queen bed , flat 32´´led tv & internet ,fan on ceiling & free standing on floor. Linen & towels are changed every week also as per request. Calle Calzada 200 m- two blocks- offer lot different activities , restaurants ,street vendors & art performers. We can arrange transportation to Managua airport ($40 US day-time & $50 US night- also available to other parts of Nicaragua. Hello, my name is Chris and I manage this charming property in the heart of Grenada. Born and raised in Europe, I am currently residing part time in Canada and in Nicaragua. My love for the warm weather and beautiful culture of Nicaragua has brought me back many times over the years. I hope you too can share and experience what I enjoy most about spending quality time in Nicaragua. Located just minutes away from the entertainment filled Cajje Al Calzada, this property offers all the comforts of home with the convenience of being close to all the fun! The historic location offers many sights to see such as the Cathedral and the Parque Central where there are plenty of vendors selling unique items. 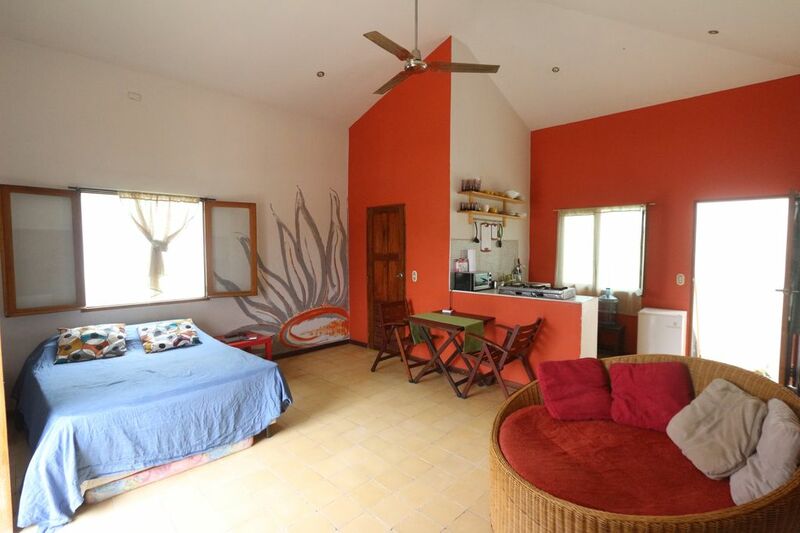 Casa Amarilla is well tended to and a perfect home for both short and long visits! A bright yellow home that is comfortable and safe with a view of the Volcano Mombacho. There is a sun terrace where you can enjoy the weather all day and view the stars at night. Personal touches make the space welcoming for all! Spacious studio very close to Calle Calzada but far enough that we weren't bothered by the late night revellers, if there were any. Great location for us as we were able to walk around, explore the city and get our regular runs in by going down the lake and back. I was also able to walk to a nearby gym. All the must have features we look for when we book our accommodations. Apartment had pretty much everything we needed. Liliam, the manager was only a phone call away. Chris the owner was overseas but always responded promptly. We requested AC but really didn't need it as apartment was cool and breezy when fan was on and windows open. No hot shower but again didn't need it as Granada was very hot during the day when we there. Wished there was a dipping pool on site but for 10 USD you could go to Hotel Granada and use theirs for the day.